Brother International Corporation which has been developing and marketing award winning products for home and office has introduced another pioneering product in the open market. Brother XR9500PRW Sewing Machine has started serving the consumer and fashion industries with several innovative features in-built in it. The team-spirited and supportive environment from Brother International Corporation has taken all the efforts to create this world-class product. To conclude this review: the Brother XR9500PRW comes at a bargain price with performance of a sewing machine that costs twice as much. Its ease of use and has fantastic features making it a perfect machine for beginners, while having so much to offer more advanced users who want something affordable. 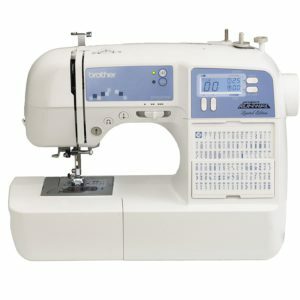 This sewing machine is light-weighted by weighing just 9.9 pounds and is portable and is completely computerized which would offer you with a broad range of convenient features. This amazing machine comes to your hands completely equipped with the large and back-lit LCD screen which would enable you with computerized stitch selection. There is an easy to use needle threading system. There are 100 in-built stitches and comes with a unique flip stitch guide. The complete set would reach you with over-sized wide table which will be useful for quilting and any other larger projects. 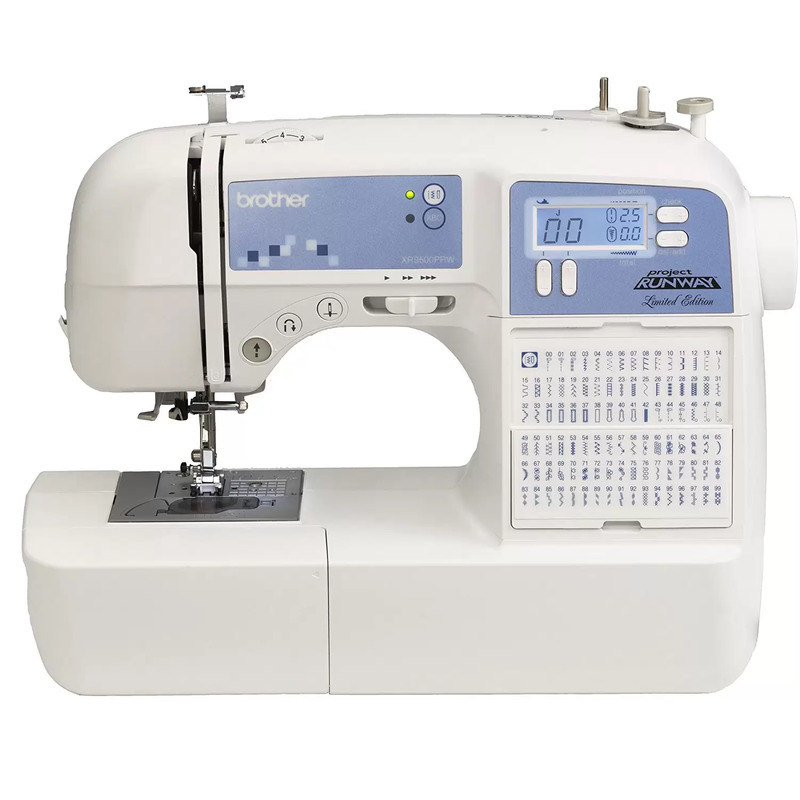 Unlike Singer 9960 Quantum Stylist, which has almost 13 buttonhole styles, this sewing model comes to you with only 8 styles of buttonholes. In addition to these, there is also an easy bobbin winding system. This is made from plastic and metal which offers the machine with the much required durability. It is important to know about the significant features of the Brother XR9500PRW sewing machine in order to understand that this is one among the best products in the current market. 100 Built-In Stitches: This sewing machine comes with as many as 100 unique stitches which would include utility stitches, decorative stitches as well as heirloom stitches. Each of these would come with multiple stitch functions. Zigzag Stitches: The zigzag stitches with the maximum width of 7 mm (super-wide) and decorative stitches are possible with this Brother sewing machine. Sewing Font: The current sewing machine model comes with built-in sewing font for the purpose of basic monogramming. For the lettering, you can choose among the 55 in-built alphanumeric stitches. Stitch Functions and Buttonhole Styles: This machine has almost 140 stitch functions. There are about eight styles of one step auto-size buttonholes in this sewing machine. Portability: Weighing just 9.9 pounds, this machine model can be transported from one place to another with much ease. Free Arm Function: The free arm feature in this current machine will be helpful to access the difficulty to reach areas like cuffs and sleeves with much comfort. Work Area: The work area in this sewing machine set will be brightly lit by LED which would provide you with optimal viewing. Also, the LED bulbs will be cool as long as you use it. You do not need to worry about the bulbs getting heated up. Position Button: The needle position button will allow you to change the position of the needle once the machine is stopped. Assortment: There is an option for full assortment of the accompanying accessories in the current machine. The sewing machine reviews reveals that the Brother XR9500PRW sewing machine has more additional features that are adding more value to the product. Threading with Ease: The sewing machine in current review would come with easy to use needle threading system which will be a big time saver for each and every user who uses this machine. Loading of Bobbin: The Brother sewing machine has been constructed with jam resistant and drop-in top bobbin system which would make it easier to load the bobbin. Stitch Selection: The large and back-lit LCD screen in this sewing machine would enable the computerized selection of stitches. There is also a unique flip-stitch guide for your reference. Faster Winding: The system has been in-built with faster and automated bobbin winding system. This makes your bobbin winding easier. Foot Controller: The current machine also features a foot controller for the purpose of gaining a complete control over your sewing process. Drop Feed: There is also drop feed feature in this machine for the purpose of free motion quilting. This would help you to create free form and traditional quilt patterns. Presser Feet: The machine is constructed with quick change standard presser feet 7 with which you can change the presser feet more easily and quickly. Sewing Speed: The maximum sewing speed offered by this model is 850 stitches per minute. The Brother XR9500PRW can be utilized more easily by the help of instruction booklet that would accompany with the machine. Moreover, the machine would reach your hands with many automatic features like automatic needle threading and automatic bobbin winding which would make all your time consuming steps with much ease in a shorter duration. Also, the over-sized table will allow you to work on quilting or any other larger projects with great comfort. By using the best use of free arm feature, you can reach the difficult to reach areas with great comfort. Overall, this machine is easier to utilize by following some simple steps and this makes this machine to stand-out as the best sewing machine in the current market. Thus, you can opt for Brother XR9500PRW Sewing Machine without any kind of hesitation upon considering the number of advantages and its utilities. By using this model, you can surely enjoy your creativity in your quilting and sewing processes.